This book traces the life of Isidor and Ida Straus, both German Jewish immigrants who arrived as children in America in the early 1850s. Isidor’s father, Lazarus, was an itinerate peddler in Georgia, but within one generation the family became the wealthy owners of Macy’s Department Store in New York. A Titanic Love Story follows the Strauses’ life from Talbotton, Georgia, where an anti-Semitic incident caused them to move to nearby Columbus. The devastation of Columbus at the end of the Civil War brought the family to New York, where Isidor met and eventually married the young Ida Blun. Ida and Isidor balanced the demands of business, family, and service to others and carved out their individual roles in those domains. A Titanic Love Story emphasizes their work together as a couple, focusing not only on Isidor’s important roles as businessman, member of congress, and philanthropist, but also on Ida’s contributions as an intelligent partner, the soul of the household, and matriarch of the family, as well as a stalwart supporter of her husband and one who engaged in philanthropic and creative activities of her own. The Strauses were wealthy Jews within their New York community, and as people committed to the welfare of their family, their city, their country, and those less fortunate than themselves, they dealt with their own grief, illness, and occasional brushes with anti-Semitism. Ironically, their final happy days in the south of France lead to their unexpected sailing on the Titanic. Both died as they had lived, with dignity, honor, loyalty to one another, and compassion for others. The public outpouring of grief at their deaths, even by today’s standards of over-the-top journalism, was remarkable. From tiny Talbotton, Georgia, to Macy’s and New York’s Upper West Side to their last moments together in the icy waters of the North Atlantic, the love story of Ida and Isidor Straus is also a story of America as a land of both prejudice and opportunity, and of a remarkable family whose generosity and compassion helped to make it a better place for so many others. June McCash excels in telling this touching and absorbing tale. Immigration, adjustment, hard work, setback, and success—they were all a part of Isidor and Ida Straus’s life. McCash’s recounting of their lives in A Titanic Love Story is more than a chronicle of the facts of their commercial endeavors. The work also sheds light on how the American dream was experienced by a Jewish family during the mid-to-late nineteenth century. 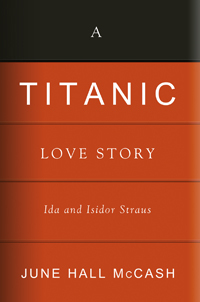 June Hall McCash has written an extraordinarily cogent and deeply moving book about the life of a heroic couple, Ida and Isidor Straus, who chose to perish in each others arms when the RMS Titanic hit an iceberg and sank at sea. With an ever observant eye for poignant detail, McCash has penned a biography that will have both interdisciplinary relevance for the scholar, and a very strong popular appeal.